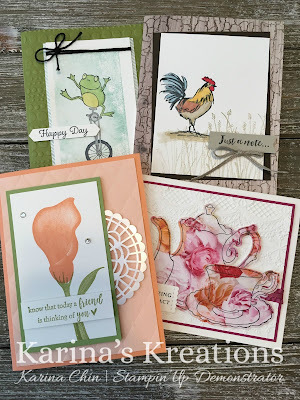 Karina's Kreations: Sale-a-bration Celebration Card Class March 31. Sale-a-bration Celebration Card Class March 31. There is only 1 week left of Sale-a-bration where you get free items with a $60 order. I'm holding an 8 card class on Sunday March 31 from 1:00-4:00 to make these 4 cards. You get to make 2 of each design. Each card features a Sale-a-bration stamp set. Contact me if you're interested in attending.Karina's email. Join me tonight at 7:00 pm for my Facebook live party at Karina's Facebook Page! Have a piece of 8" x 8" Designer Series Paper Ready along with the envelope punch board and paper trimmer and stamp along with me.